Capturing and sharing software architecture design rationale has always been particularly challenging in complex application domains such as enterprise computing. Facing the ongoing acceleration of technology innovation and economic forces such as outsourcing and offshoring, conservative knowledge management practices and existing tools are no longer sufficient, offering only rudimentary support for knowledge exchange and collaboration on the Internet. 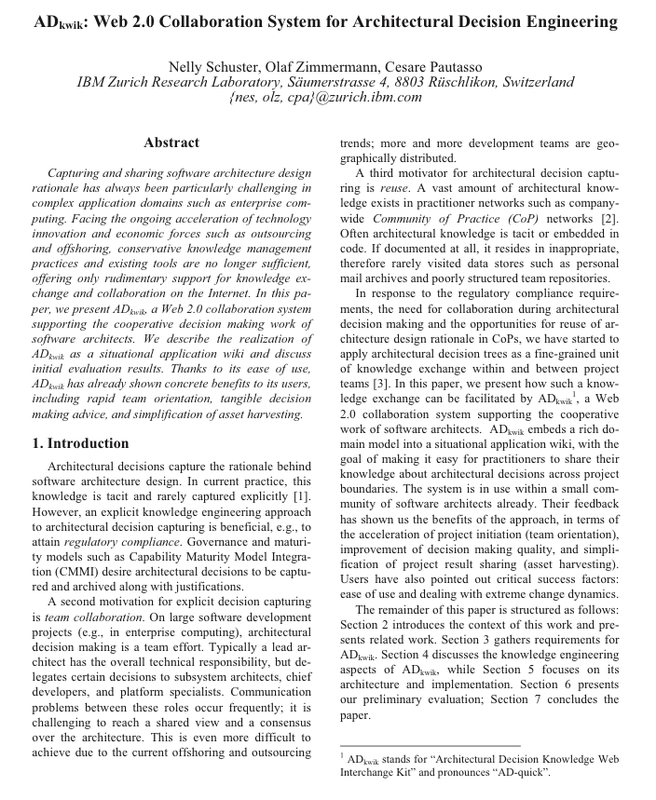 In this paper, we present ADkwik, a Web 2.0 collaboration system supporting the cooperative decision making work of software architects. We describe the realization of ADkwik as a situational application wiki and discuss initial evaluation results. Thanks to its ease of use, ADkwik has already shown concrete benefits to its users, including rapid team orientation, tangible decision making advice, and simplification of asset harvesting.